Buy my favorite ones here! 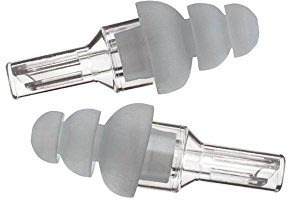 2: Cheap: Etymotic ETY-plugs. These are sooooooo goood. I, being a geek, have often wondered how Superman's sense of touch works. He can feel incredibly fine detail through super-sensory powers, but he certainly doesn't feel getting hit by a missile in the face more than a normal person. So there must be a threshold where the curve of sensory overload just sort of slopes down to almost a stop. That's what it feels like to wear these earbuds. You can still easily have a conversation at normal volume. The general sounds of a quiet summer day in the forest are only dampened the tiniest bit. But you can also walk directly in front of a too-loud DJ speaker blasting to a giant concert hall and be OK. In fact, you can hear people speaking at normal volume far *better* in wedding receptions, and the only problem is you have to remember that they can't also hear you unless you yell. This will not only save you from permanent hearing damage, but it opens up shooting opportunities. On many packed dance floors, the only place to stand is right in front of the speakers, which are so loud even drunk people know they're bad for them. This allows you to get in, out, and around, and all sorts of close angles of dancing that might be otherwise difficult. 4: Free: Because your hearing is crucial, take care of it even if you have no other option. Go to the bar, get a paper napkin. Tear off half, and then tear that in half. Take those strips, fold them over, dampen them very slightly … and put them in your ears. They should be large enough to fill the canal and also to be able to easily pull out again.